Easy on, easy off…for exercise, people! Hey, ya’ll! Today, to celebrate both Valentine’s Day and Love Yo’Self Week, we have an underwear review for you! And not just any underwear—underwear that’s super easy to put on. And take off! Even without taking your pants totally off! No, we are clearly reviewing Claspies, easily removable underwear, for their benefits to workouts, training and all things outdoorsy. Things like backpacking when it’s so cold taking your pants off feels like THE HARDEST THING to needing to change in the car after a race to switches into fresh duds without having to maneuver around an icky locker room floor. Not things like semi-public quickies. Although we imagine they’d be pretty well suited for that, too. With little clasps or “claspies” on each side, this bikini-style underwear easily go from on to off. 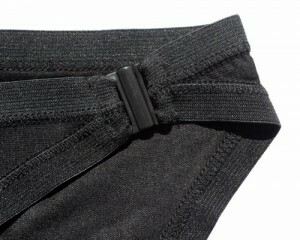 Just roll down your pants—no need to take them off—unclasp the Claspies you are wearing and clasp on a new pair. Comfortable to wear, they’re also kind of fun to clasp and unclasp. The only thing to beware of is that sometimes when you unclasp half, they kind of pop off. Not a problem if you’re rolling solo, but if you’re trying to be discreet, well, it might draw attention. And if you are trying to draw attention, well…there you go. At $15 a pair we won’t be switching out all of our undies for Claspies, having a few pairs on rotation and at the ready for events and camping trips is smart thinking for the lady parts.